In an annual technology exhibition called the Gitex Technology Week is currently taking place in Dubai, United Arab Emirates, October 8-12, 2017, the Dubai Police presented various their support tools either in use today or for the future. One of them, a Hoversuf-flying patrol vehicle. As quoted of The National, these device used to prevent and fight criminality in the future and referred to as the latest innovations of Dubai Police. 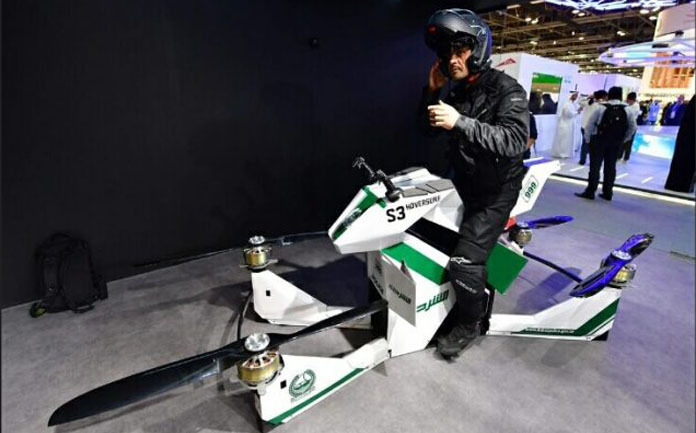 The Hoversurf exactly is a blend of a motorcycle and drones. It will be used to the police patrol duty with a human pilot or remotely. Hoversurf suitable used for patrols in various terrains, such as hilly and rocky terrains including deserts and beaches as well. Hoversurf is equipped with 4 propellers in each corner, allowing to fly as high as 5 meters above the surface if directly drive by one man. But if flown by remotely control like a drone, the Hoversurf can drift up to a height of 6,000 meters. These Hoversurf-flying motorcycle uses the battery that allowing it to float for 25 minutes if its battery in fully charged condition, but it can fly for 1 hour if using a machine. It has loading capacity reaches 300 kg, and a maximum cruising speeds reach 70 km/h. If noticed, how's it work is similar to the Kitty Hawk Flyer of San Francisco, United States as in the following video.